World Challenges are competitions against random, unknown opponents to see who can get the most wins in an hour. The player with the highest tally of wins (and meets all game requirements) at the end of the hour wins neopoints from the jackpot as well as a piece of a picture. There are two ways to get to the World Challenge Page. First is to use the World Challenges direct link and the second is from the Games Room. From the Games Room, you can click on any game and to the left you have the Friend Challenge, High Scores and World Challenge buttons. First when you find your game, you will see something similar to this. All you need to do is have 100 NPs on hand and click "Enter the Challenge!" Next, the page will automatically refresh and you will see something similar to below. To play the game you need to click the "Play and send your score!" link. Keep an eye on the hour clock countdown that way you know how much time you have left to play. How Do You Play World Challenge? 4. Once you enter, the page will automatically refresh and you will see the game window link. 5. Play the game and send your highest possible score. 6. After sending your score, it will probably pend until someone else enters to match against the score. 7. Wait for at least 5 players to qualify for the hour. How Do You Win World Challenges? You can send as many scores as you wish for the hour, but the idea is to win, so don't send a bunch of low scores in hopes of winning. It's better to play hard and try your best to get the higher score. There is a certain requirement for winning. 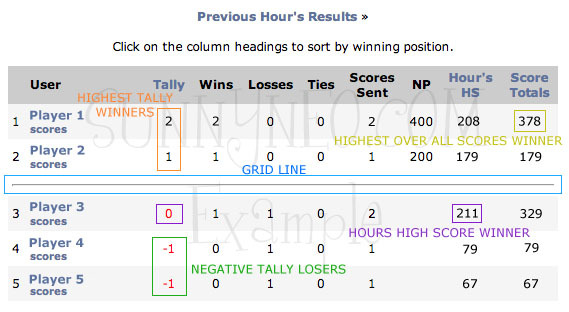 The top 2 above the grid line are automatic winners and if there are 6 or more players, the top 3 are automatic winners. But if your score is greater than 0 you have a chance at winning the Hour Highest Score and Highest Over All Scores. You can only win once per entry. As you can see Player 1 has the Highest Tally Winner and the Highest Over All Score Winner. Technically, they have two wins, but they are only eligible for one win. You are also restricted to win only 3 pieces of any map a day, but you can continue to play to build yourself higher on the Monthly and All-Time Winners pages for each game if you wish. There is also a limited number of people who can win each game. This prevents people from taking over and fixing wins on the unpopular games. Once you have your map pieces, you can add them into your gallery. To add them into your gallery, you can either click the piece in your inventory and you will see a link to the specific world's gallery. Once you are at the World Challenge Gallery, you have two options. 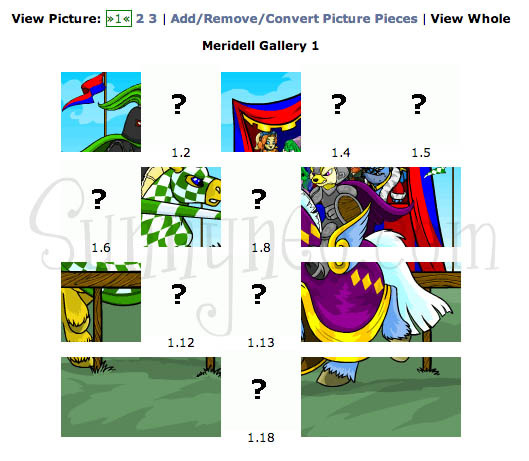 To view the gallery as a whole and to add and remove pieces. When removing pieces from your gallery, they go straight to your inventory. From there you can choose from the normal item options. 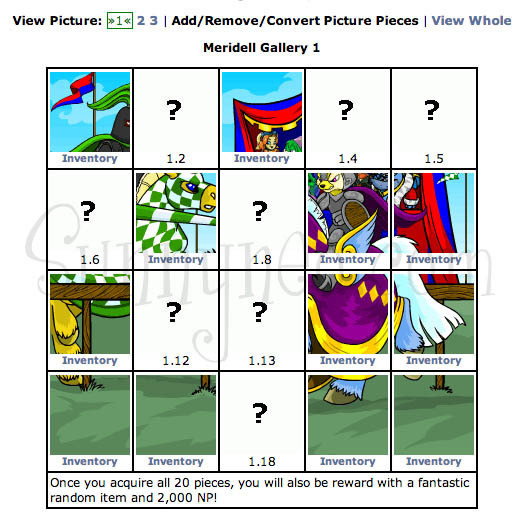 Note: If you choose gallery from the drop down list, it will go to your regular Neopets Gallery, not your World Challenge Gallery. Once you have all of your map pieces, you are ready to convert your map. After converting your map, your window will be automatically refreshed, and you will see something similar to below. When scores are not processed, they become pending until the match up against someone else's score. If your score continues to pend after the hour, it does carry over to the next hour. Buying full maps as a whole is not recommended, some maps are very expensive and buying the full map may cost you more than you actually win from converting the map. It's better to play the games to try and win the maps. If you are close to finishing a map, you may want to consider buying the last 1 or 2 pieces to convert it depending on the cost. The prize you win is random from each Tier, so you have to decide if it's worth spending your neopoints to finish off that map. DO: You can ask people to play so the scores don't carry over to the next hour, but you cannot ask people to lose on purpose. DON'T: It is cheating to "fix" the World Challenge by asking people to send a bunch of low scores on purpose, posting your score and telling them not to beat it or trying to set up a time to "match" your score. There are 12 worlds in total with their selected number of games in each world. Some games may not be eligible to play each day. Click on the location to view their respective maps. 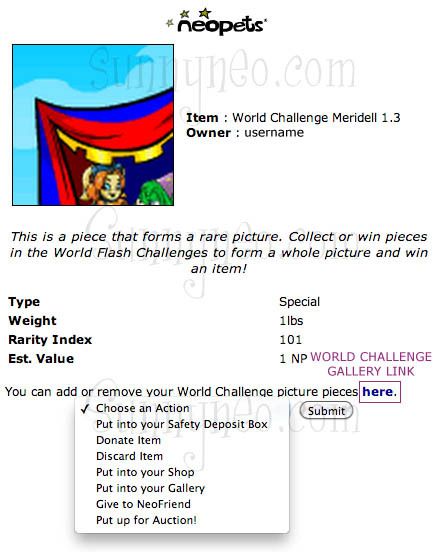 Each time you win a World Challenge, you win a share of the jackpot and a random numbered World Challenge map piece. Each map piece you win depends on which world you played in. There are 3 levels for each map. You have to collect all 20 pieces of each map to convert the picture and win your prize. Each time you convert the map, you win 2,000 NPs and you go up 1 of the 3 Tiers. You have to finish and convert Tier 1 Maps before you can start earning for Tier 2 maps and you have to finish Tier 2 before you can start earning Tier 3 maps. Once you have finished Tier 3 you will move back down the scale to Tier 1 maps. There is a limited selection of things you can win from each Tier. When converting maps, the prizes are completely random from each Tier, sometimes it may be worth it, while other times not. We have complied a list of things you can win from each tier. You can link back and share this guide with your friends by using one of our World Challenge Buttons and Banners.